These precede the dog's name on a pedigree. SG-Sehr Gut-very good The SG rating is the highest offered in young dog competitions, 12-18 month and 18-24 month age groups, as well as following the VA and V awards in the adult classes. KKL2-Breed survey class 2. There are a number of things that determine which breed survey classification a dog receives. HIP Certifications-the "a" stamp is required for a dog to pass a breed survey. Sieger-the best male at the national conformation speciality show of that respective country, countries other than Germany also have Sieger shows. Siegerin-The best female at the national conformation specialty show of that respective country. 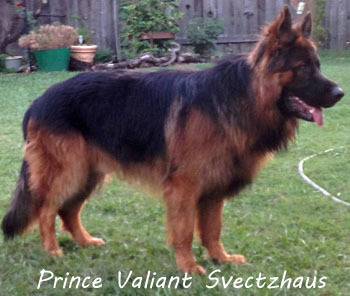 VA-The Sieger is VA-1, and a few other extremely good dogs also usually receive the VA rating, meaning they were very close to the Sieger in the judge's opinion. 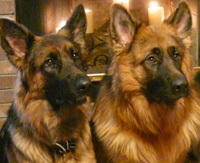 SchH1,2,3-Schutzhund includes three different phases which are tracking, obedience, and protection. A dog must pass all three phases and have an overall passing score to earn a SchH title. FH2-Higher level of Trailing Dog competition. INT-International SchH title. DPO-Police Dog competition title.